I don't see the Pan X and Pan Y setting documented anywhere? Not here in the forum documentation, not on the NGUI docs page, not in the class docs. Would be cool if we got an official explanation. I understand these settings are related to setting a scroll bar via a console controller? I've added an explanation to the original post. This methods are called every frame like the method Update(), or they are called only once when they are triggered by the camera? Only when the event gets triggered, and only on the game object that they were triggered on. Doesn't need to be a widget. Thanks for your answer ArenMook. I understand that then, from a performance point of view, is better to use this methods than the Update method, isn't it? Is it possible to do something similar with your eventsystem? Another thing i recognised is that while a mousebutton is pressed, no OnHover is getting triggered. Though for most cases this behavior is totally fine, is it possible to override you event-behaviors with a custom one? @Diego: The update method? If you mean doing your own Input checks, I would say so, yes. @The-Arrival: I never liked the interface-based approach personally. From coding point of view it's more neat to not have to derive from some specific class. Much less code too -- no need to register anything either. The performance cost of relying on SendMessage in this case is negligible to the point of being invisible. The only downside is no native way of letting certain events fall through, but that can be remedied inside the desired function itself by forwarding the event to a sub-object if desired. - My MainCamera also has the UICamera Component set to some a "GameObject layer" wich is set on some clickable objects in my scenes. - I´m in Debug mode to follow which objects get triggered while hover. In a second scene everthing is setup similar, but if i hover nothing it detects the MainCamera itself. The other strange thing (besides two similar scenes have diffrent behaviors) is that the maincamera object is on "default" layer which is not included in any events mask. Any idea what might be wrong here? If you want events to go to a specific object when there is no collider hit, set UICamera.fallThrough to your target. 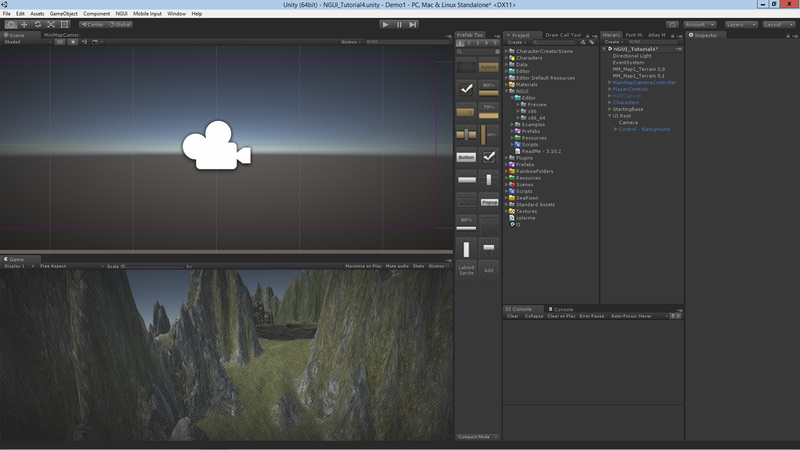 How to get rid of the giant MickyMouse camera in the middle of NGUI's Editor's UI? Also, how to get custom prefabs to render to the Prefab Toolbar? Figured out that I could change size of icon via the drop down Gizmos. we are using multiple displays in our systems. System is working perfect if Camera target display is 1 ( camera means UICamera on the NGUI ). When i change the camera target display 1 to 3 i lost the button events from NGUI. GUI paints but i lost all events. Its working when i return to display 1 ? Is there any solutins for this ?